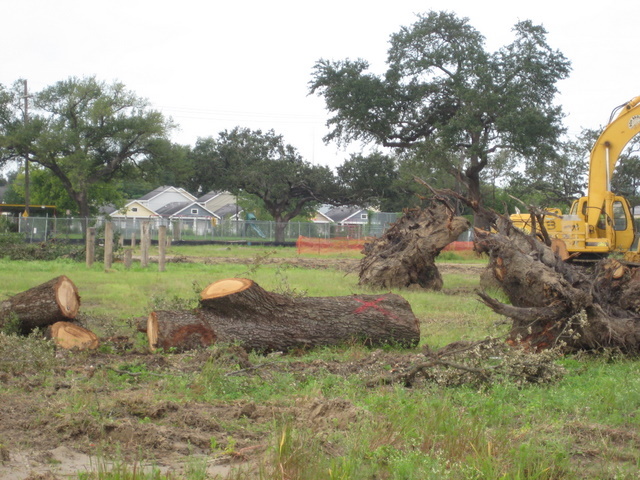 Stately City Park Oak damaged by construction to build concrete forms. Well paid City Park designers, contractors and staffers continue to abuse and kill the precious live oaks under their stewardship. The Great Lawn project, part of the park’s Master Plan, is currently under construction. Just as with the Pavillion of the Two Sisters, a project that killed nearly a half dozen trees with at least one still barely holding on; and, with the loss of trees in the Sculpture Garden ongoing, all due to bad planning and implementation that failed to properly protect the soil and delicate root systems of the trees, the park is in trouble. As I said in a previous post, City Park is being paved over. Already, an acre has been slathered with a suffocating coat of toxic asphalt. The Master Plan calls for many more acres to be encased in life-starving, impermeable concrete and asphalt because too many people in charge don’t know readily available procedures for Best Management Practices for a public park. As I’ve noted, New Orleans City Park should be the green heart of the area. It should be the leader in sustainability and green principles to which we all turn to learn about and witness how humans properly manage the natural spaces our parks represent. After witnessing the construction of the Big Lake project and it’s poor choice in materials, tree selection and placement, and water management strategies–which connect to all these issues–I believe the park is in the hands of people who are reshaping it in ways that reflect the mindset of a bygone and downright ignorant time. I am writing to urge you to act swiftly to prevent further damage to live oaks in the park; and, to add appropriate arborists and local green/sustainable design experts to the paid teams developing and implementing the park’s Master Plan. Apparently, the overall planner for the Great Lawn project designed it to include concrete structures around the base of the large live oak across from the Peristyle. The design does not take into account the needs of the tree. Damage is happening now, with large areas deep under the canopy dug-out, lined with gravel and framed for concrete. Additionally, there is a trenched square nearly a foot deep under the canopy, cut across the roots. As a lifelong advocate for live oaks, a recently trained Parkway Partners/Louisiana Urban Forestry Council Certified Citizen Forester; and, having learned Best Management Practices at Jefferson Tree School, a continuing education program for arborists, I know that the top 18 inches of soil are the most critical to the health of live oaks. The photos show the “improvements” underway have removed the top layer of soil and deeply trenched a section, cutting vital roots. This is clearly a case of destructive design and construction that should have been stopped at several stages of the process. With the heat, drought and now root damage, this tree will suffer significant die-off from which it will never fully recover. I believe you should immediately bring in a local live oak expert such as Scott Courtright or Tom Campbell to evaluate and try to remediate the damage already done. It is time for City Park to stop using impermeable hardscapes that suffocate the soil, kill the trees, increase flooding and erosion, and speed pollutants into our precious waterways. No more impermeable concrete or toxic asphalt! In researching this situation I learned an important fact regarding landscape architects: their degree does not require them to be arborists. To me, this explains many things regarding how and why trees have been damaged in City Park. Trees seem to be chosen by the park’s go-to landscape architect with appearance superseding appropriateness. Paving systems are designed and built without an arborist’s understanding of their impact. This is not in line with Best Management Practices for native flora, water management, enhancement of the flyway and wildlife, or Low Impact Design. Any number of people in our area are experts on these matters. Some of them are cc’d in this email. This is not a job for volunteers. Well paid contractors–using taxpayer funding and donations of people who assume we’re using BMPs–are currently creating these destructive actions. It’s past time to include paid local experts who can help the park become the green leader we all need and deserve. City Park oak damaged by trenching under canopy for concrete form. City Park oak being damaged by construction of concrete forms for Great Lawn project. Update on concrete form as of Thursday, August 6. Probably going to be some kind of iconic Great Lawn fixture or sign. So this oak is going to end up looking like an amputee as it dies-off thanks to this unbelievably stupid implementation of the design.